For some people, the holiday season feels anything but merry and it’s hard to pretend. Maybe you’ve lost a loved one, and this season does not feel the same without him or her. You may be recently divorced, and the traditions and celebrations you shared as a family are now gone along with your wedding ring. Or, perhaps you live alone and the holidays only magnify your isolation and lack of family or close friends. Other people dread Christmas because it conjures up bad memories of holidays past when there wasn’t peace, joy or good will, only drunkenness, disappointment, conflict, and hurt that continues to rage wild even if you wished it wouldn’t. If that’s you, or even someone you know, let me share a few things that might help you get through these next few weeks. Allow yourself to feel your feelings. Give yourself permission to grieve and process your pain. As Christians, sometimes we feel guilty for having negative emotions. Jesus knows how you feel, and you never have to pretend with him. Take some time to journal out your questions, your emotions or your complaints as David did when he wrote his psalms. He often discovered after writing, he not only felt better, but he experienced God in a new way. Look daily for the good. When we’re in pain, it’s hard to be intentional to look for the good tucked within each day. Before you go to sleep, scan the past 12 hours of your day and ask yourself what happened today that you’re most grateful for? Write it down. Keep a gratitude journal of the things you have to look hard for in order to see them. The Lord tells Isaiah, “I will give you treasures hidden in the darkness – secret riches. I will do this so you may know that I am the Lord, the God of Israel, the one who calls you by name” (Isaiah 45:3). Do an act of kindness for someone you don’t know well. We can always find someone who is in need of a kind word, a good meal, a meaningful card, a hug or a little bit of our time. Jesus said that it is more blessed to give than to receive. While you may not feel like it, give something of yourself to someone less fortunate. It will bless you as you bless another person. Allow yourself to receive. Sometimes we’d rather sit home and eat a can of cold soup than accept an act of kindness from another person. We’re embarrassed and don’t want to feel needy. Yet God may have put you on someone’s heart in order to bless you. I remember early in our marriage my husband became ill with a life threatening problem. Our family didn’t live nearby, but the people from our church rallied around us and not only loved us through it, provided cash for us to pay for some of the expenses of it. It was humbling, but it met our financial need and it touched our hearts. Let yourself receive their act of kindness. You both will be richer for it. Christmas is a joyous occasion but not in the way we usually celebrate it. Christmas isn’t about trees and gifts and carols and special cookies. Christmas is about God. Emmanuel, God with us. He sent Jesus so that we might know what God is like. “So the Word became human and made his home among us. He was full of unfailing love and faithfulness........No one has ever seen God. But the one and only Son is himself God and is near to the Father’s heart. He has revealed God to us” (John 1:14,18). What Are The Consequences for Serious Sin? Question: I so enjoyed your book, How to Act Right When Your Spouse Acts Wrong, I want to read it over again and pray and meditate on some of the truths you wrote. However, in reading the book and praying, I’ve been a little confused. I’ve also been doing a bible study on the Wife of Noble Character. I am learning how to handle myself when my husband is sarcastic or short tempered, but where I have found it difficult is if he says something to me that is really hurtful and mean or when I catch him in a lie. For example, he was out of town when his cell phone accidently dialed home. When I asked him where he was, he told me he was in his hotel room when he was really with his coworkers at a bar. He apologized later, but I fear it can’t be the first time he has lied. Also, when I forgive him for instances like these and even bigger things like when he’s been verbally abusive towards me, it’s hard to be intimate and I really don’t know how to respond. He’s a good father and good man in so many ways, but at times like these I just don’t know what to do. Answer: You are on the right track by attending to your relationship with God and to your own responses rather than trying to change your husband. One of the things that you identify that is greatly impacted by your husband’s behavior is your ability to trust him and your desire to be intimate. Honey, those ARE the natural consequences for what is happening in your relationship. It still surprises me that people fail to understand a simple Biblical concept. The apostle Paul says “what we sow, we reap” (Galatians 6:7). In other words, your husband cannot lie to you and verbally abuse you and continue to expect that your marriage will thrive and feel close, warm and intimate. That’s like stomping on my flower garden and still expecting flowers to grow, or showing up late for work and still expecting my boss will give me a promotion and raise. It doesn’t happen that way. Your husband might be a great guy 75% of the time, but what about the other 25% or even 10%? What’s that negative time doing to the stability and health of your marriage and family life? If I stomp on some of my plants only one time, they’re finished blooming. That’s it. Please don’t misunderstand what I’m trying to say. No marriage has 100% great times. There is no perfect husband or wife and so there is sin and suffering in every marriage. But how those difficult times are dealt with and repaired makes all the difference in the health and well-being of the marital relationship. It sounds like you’re trying hard to do your part to not overreact, return evil for evil, or treat your husband disrespectfully just because he treats you that way. However, if he continues to lie and/or verbally abuse you, his actions are just as destructive to the health of your marriage as swinging an axe into your bedroom walls would be to your physical home. Acting that way causes damage and it takes time to repair it. The more often it happens, the harder it is to keep fixing it. I want you to gear up for battle through prayer. You are an ezer for your husband and your family. Paul tells us God gives us power to demolish strongholds (2 Corinthians 10:4). Next, you are going to prepare your heart to have a hard (not harsh) talk with your husband about what’s going on and the consequences to your marriage when he chooses to lie and verbally abuse you. Jesus says we prepare for these kinds of hard talks by taking the log out of our own eye before we try to remove the speck from our brother’s eye (Matthew 7:3). So deal with your anger, face your fear and see if there is any resentment or bitterness or whatever sin that is in you that Satan could use to confuse you and twist things around. 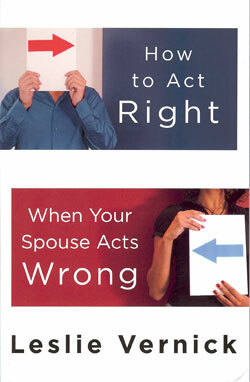 How to Act Right When Your Spouse Acts Wrong book by Leslie Vernick. Plus see the winner of the previous give away! There are no perfect marriages or perfect spouses. We know that having a good marriage requires effort and hard work. Yet we often don’t know how to continue to love when we are angry, hurt, scared, or just plain irritated. Nor are we sure what that kind of love is supposed to look like. Should we be patient? Forgive and forget? Do something else entirely? In How to Act Right When Your Spouse Acts Wrong, you’ll find the answers to these questions and more as Leslie reveals how God uses the imperfections, differences and sins of your spouse to help you become more like Christ. discover how to respond wisely when wronged. see yourself and your marriage through the lens of God’s eternal purposes. learn how to love and to keep your promises when you don’t feel like it—or when your spouse isn’t keeping his or hers. understand how to act when love must be tough. Just email your name to assistant@leslievernick.com by midnight Friday, December 14th for a chance to win one of two copies! Congratulations to Karen B. winner of the $50 in free merchandise. Her (Leslie) material was biblical, relevant, interesting and easy to follow. She was very transparent, personable, sincere and had a good sense of humor. Leslie always followed the time constraints of our schedule and availed herself to the ladies for personal conversation and counseling during free time. The women were very appreciative of our choice of speaker. I, personally, was blessed by her humble manner and the way in which she ministered to the ladies.